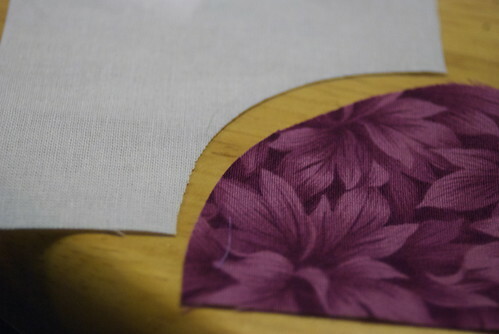 I learned a couple of months ago that there was another fabric shop here in town, and they had a longarm quilting machine with hourly rentals available to people who had taken a class to learn how to use it. 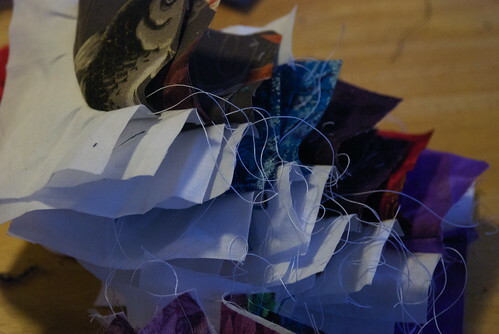 Given that paying a quilter costs a chunk of change and also takes a significant amount of time, I decided to take the class. 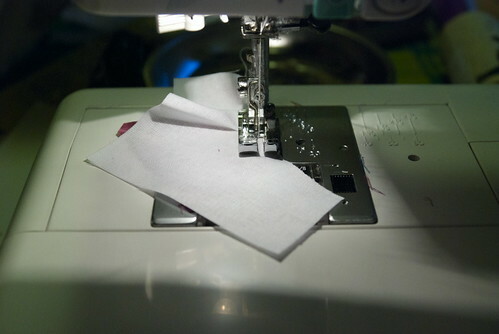 I'm currently trying to wrap up a baby quilt for Chris and Sheila (who will be adding to the plethora of baby girls born to my Huntsville set of friends in the past two years -- five so far, another one due any day, and Chris and Sheila's being the seventh) before my next appointment with the longarm quilt machine. 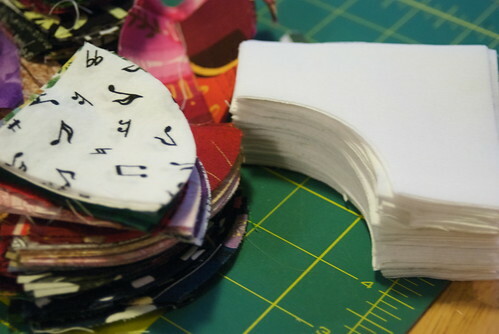 I'm still working on Adam's quilt (I need some more time to think) and I decided to make good on my promise by pulling out the quarter-circle scraps left over from Discothèque. 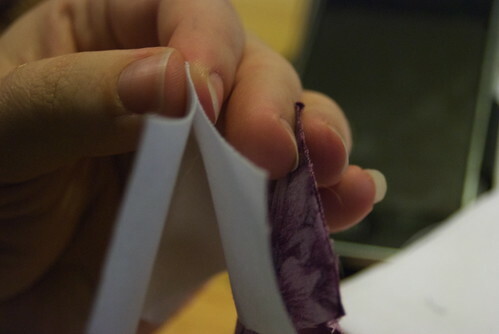 Sewn into backgrounds, they'd make really nifty circles. These blinkenlights are most emphatically FOR gefingerpoken! I've already cut out a good number of white pieces to serve as the backgrounds. On the left are a few of the quarter-circles left over from cutting Discotheque. Since Chris and Sheila (who will get this quilt) are good friends with Jon and Ashley (who got Discotheque) I liked the idea of having fabric in common. Really, what they need is a good strong smackdown by a steam iron, but a gefingerpokening will do. They don't look like they're going to fit together, do they? They will. Honest. Admit your disbelief. It's okay. Make your flying nuns at home! 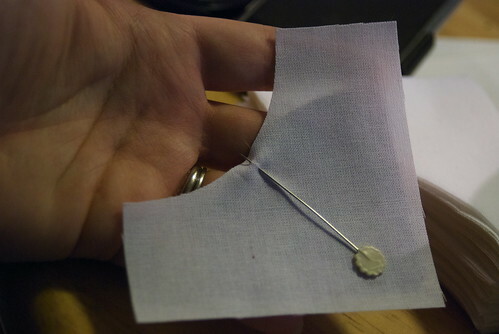 Or, just fold the background fabric in half to find the center, and finger press to get just enough of a crease so you'll know where to pin. Try doing both pieces at the same time for extra awkwardness! Better yet, try holding a camera in the other hand! Match up your little creases. Pin right at the center. 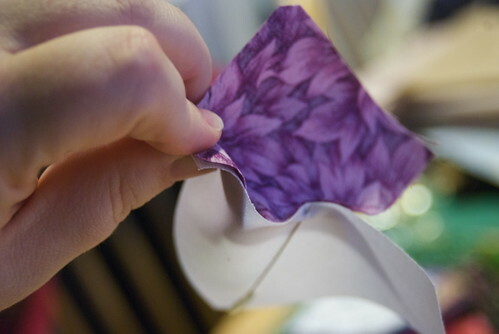 Remember that the layers need to be free to move and curve, so you don't want to take a huge bite out of the fabric. 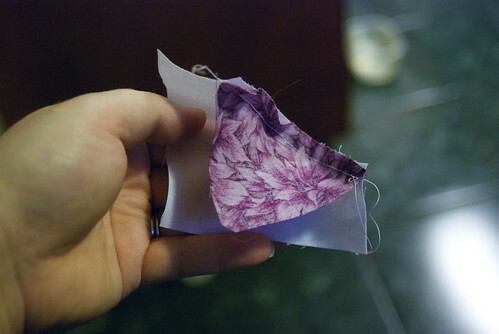 Now force the edges of the fabric together. They will pout. They don't wanna. "But we're curved!" they say. 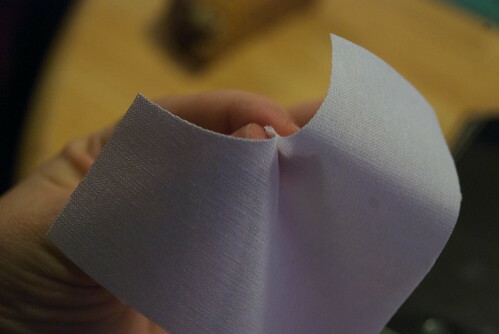 Stop your whining, fabric. 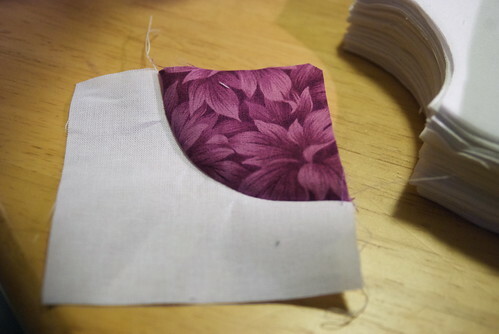 Start sewing the curve. It's going to be awkward and you'll have to sew slowly, because this isn't matching up clean straight edge to clean straight edge. 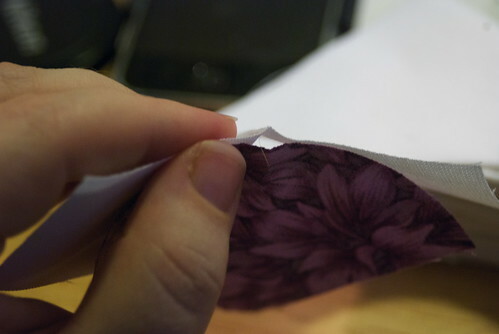 It's okay to admit that you still don't believe me that it really fits. See! All that awkwardness gets you something good. 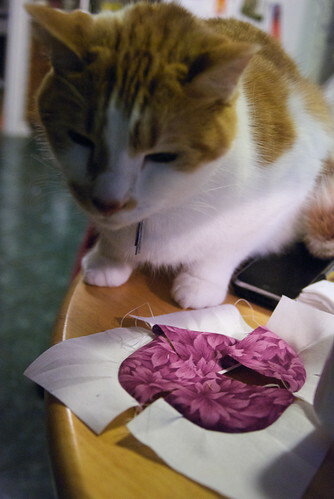 Tenzing inspects the current set of pieces for quality and lack of cat fur. 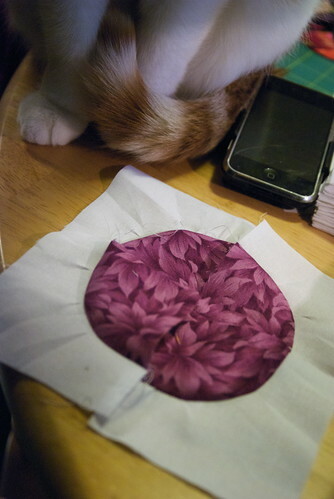 He approves -- and so do I. Sew four of these together and that's one blinkenlight. I'll need ... uh ... about fifty-four more. We'd better get back to work. In honor of St. Patrick's Day, I think we'll be sewing to Dropkick Murphys "For Boston" tonight.